Ahead of the 24th January ENVI Cttee vote on the Circular Economy Package, the European Container Glass Industry pointed some key recommendations focusing on four major issues for the industry and policymakers. Glass is a permanent material. By having fully integrated glass recycling into its industrial processes since decades and advocating for separate collection systems of glass across the EU, the European Container Glass Industry is a pioneer of the circular economy. 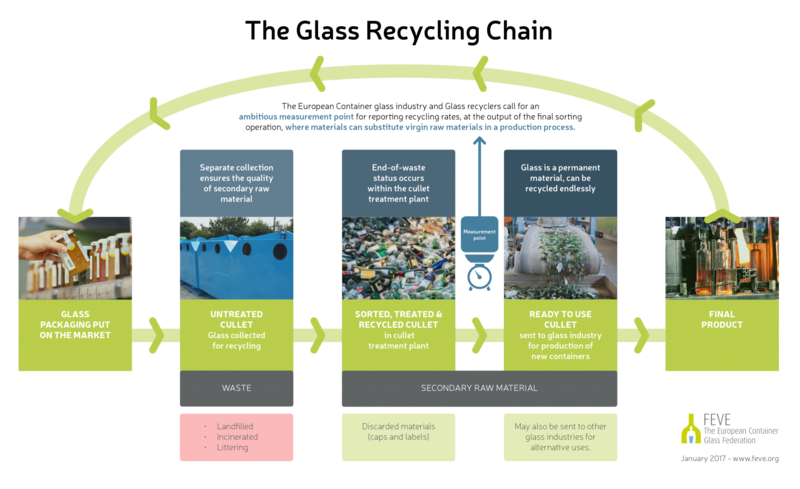 Across the European Union, strong public-private partnerships are linking public authorities with the glass industry, value chain partners and consumers on a common project to maintain quality recycled material in the production loop, for maximum resource-efficiency. But still more needs to be done. Targets for packaging waste should focus on recycling and nothing else. Specific targets on the re-use of packaging fail to take into account the dynamics of the packaging market. All material streams should have an equal level of ambition so that recycling rates are measured at the comparable point where recycled materials can substitute virgin raw materials in a production process – this means the net amount of recycled material after all losses. Packaging and packaging waste legislation should remain neutral on comparing packaging types on the market-place, but should rather focus on setting rules and principles for all materials to fulfil. We support all efforts to incentivise and promote quality recycling of packaging materials.